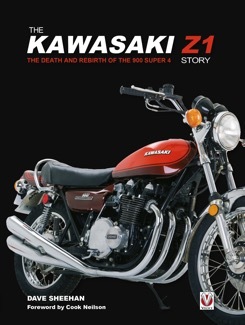 The Kawasaki Z1 Story tells how the smallest of Japan’s Big Four motorcycle manufacturers nearly beat the world’s biggest to become the first to the market with a Four, and how Honda’s CB750 debut almost spelled the end for the Z-1 … before Kawasaki stunned everybody with something bigger, faster, and better! Just as Kawasaki was about to green-light the world’s first mass-produced across-the-frame four-cylinder motorcycle, Honda pulled the rug out from under them, unveiling the CB750-4 at the Tokyo Show in 1968. It lit the fuse for what was to become motorcycling’s most explosive decade. In never before published interviews, with the men responsible for the bike code-named ‘New York Steak,’ Dave Sheehan relates the story behind the Z1’s development; the secret US testing programme in which a team including Imola-race winner Paul Smart rode pre-production bikes disguised as Hondas coast-to-coast across America. The Kawasaki Z1 Story examines the myth, truth and legend surrounding the Z1’s first race win – of which even Kawasaki knew nothing. Here, too, is the full story of the epic three days at Florida’s legendary Daytona Speedway when a trio of Z1s broke more than 50 speed endurance records. Covers the period 1837-1978, but with particular focus on 1972.